Despite being one of the most prolific releasers of commemorative coins in the world, the Royal Canadian Mint has been expanding its selection of coins struck by other mints for countries other than Canada. A fair few from the New Zealand Mint, such as some from the Disney and Feng Shui series, make up the bulk of them, but they’re bringing some more unusual product to market as well. The Discover China set was a fine start, and they’ve recently announced a subscription for the Mint of Polands fine SOS Endangered Animal Species series of ten coloured silver coins. 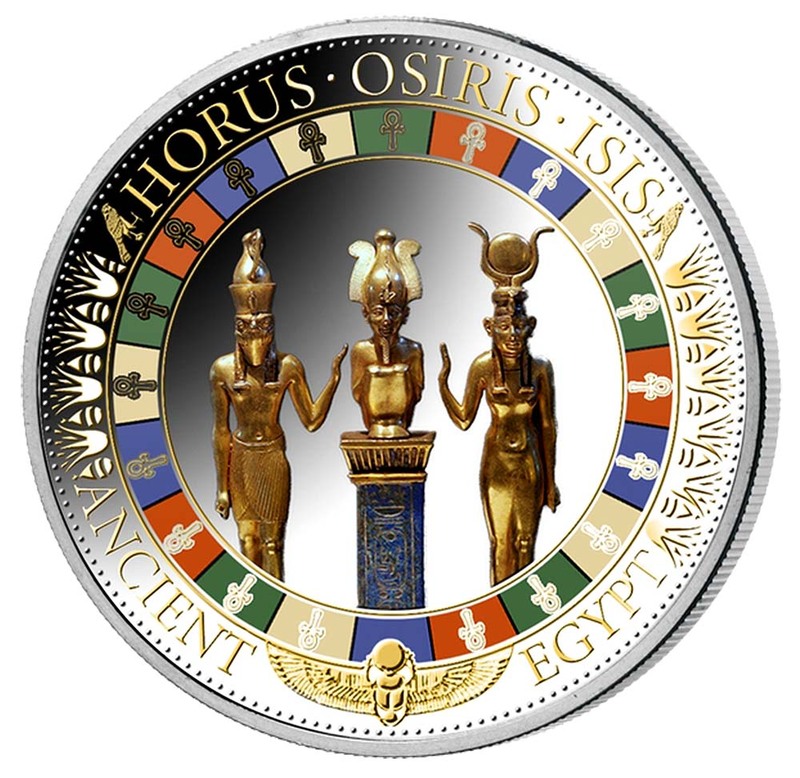 This latest offering is from the Mint of Berlin and again comprises ten, coloured, sterling silver coins. 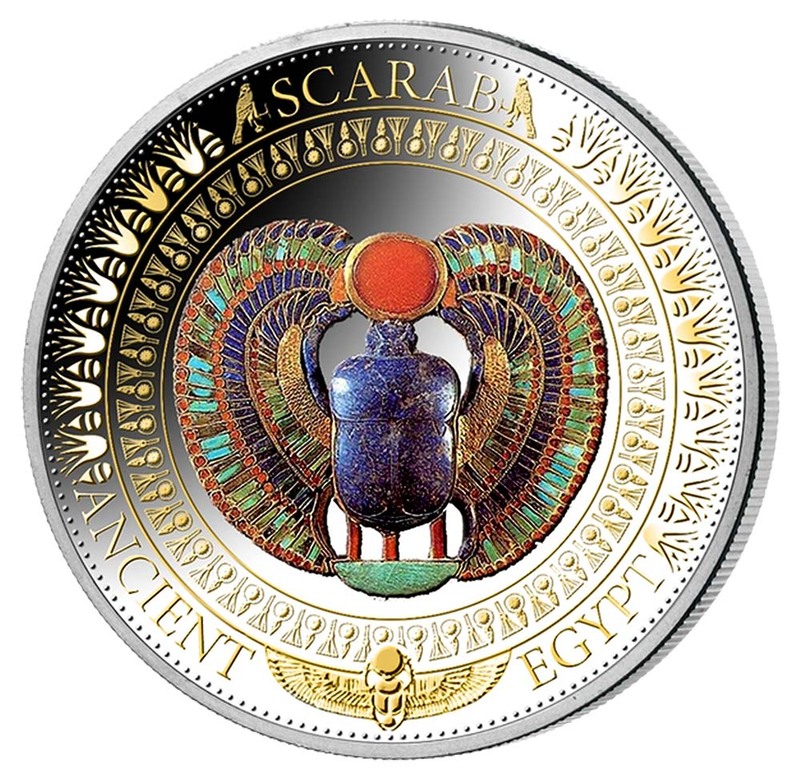 Called “The Fascination of Ancient Egypt“, each coin is coloured and gilded, and despite weighing just 12g, they maintain a diameter more often associated with full 1oz coins, 38.61mm. This is obviously done by making the coins thinner and these will come in at between 1-2mm. The selection of subjects is first-class, being both interesting and far reaching with subjects covering gods, monuments and artifacts. Quite heavily coloured, which may put some of, it’s actually quite in keeping with the nature of Ancient Egyptian culture. Offered at $39.95 CAD each and on a subscription. The subscription starts in September and continues one per month, with a card folder to hold the collection coming free with the third coin. 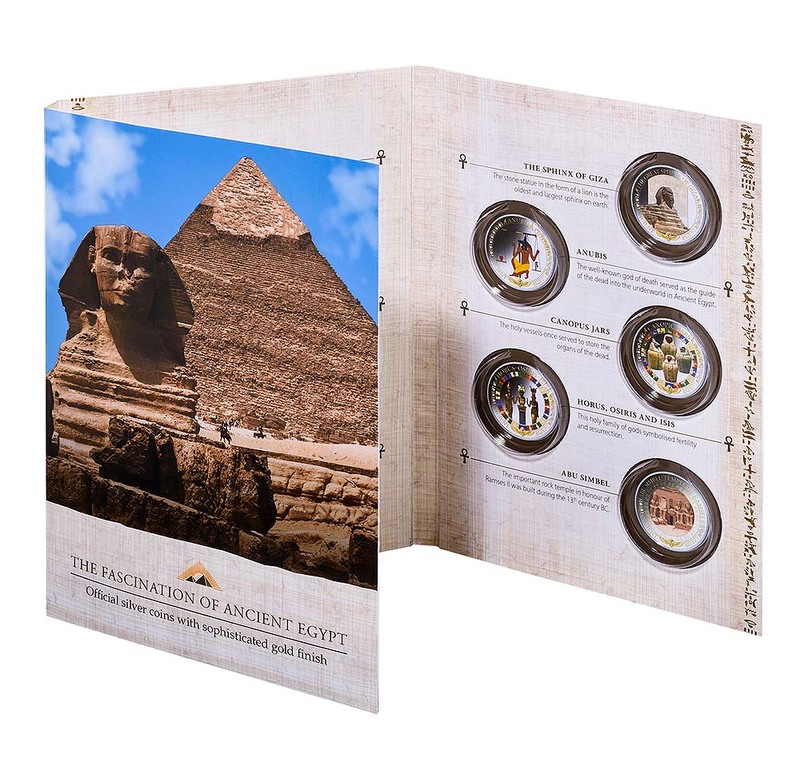 A nice gift for the fan of archaeology, the price makes them eminently affordable. These aren’t the first Solomon Island issued Ancient Egypt coins. Allcollect released a really beautiful Nefertiti bust-shaped piece late in 2013, but that single piece sells for more than this entire set, so not really in competition. Was an Egyptian pharaoh of the 18th dynasty (ruled ca. 1332–1323 BC), and ruled during the period of Egyptian history known as the New Kingdom. 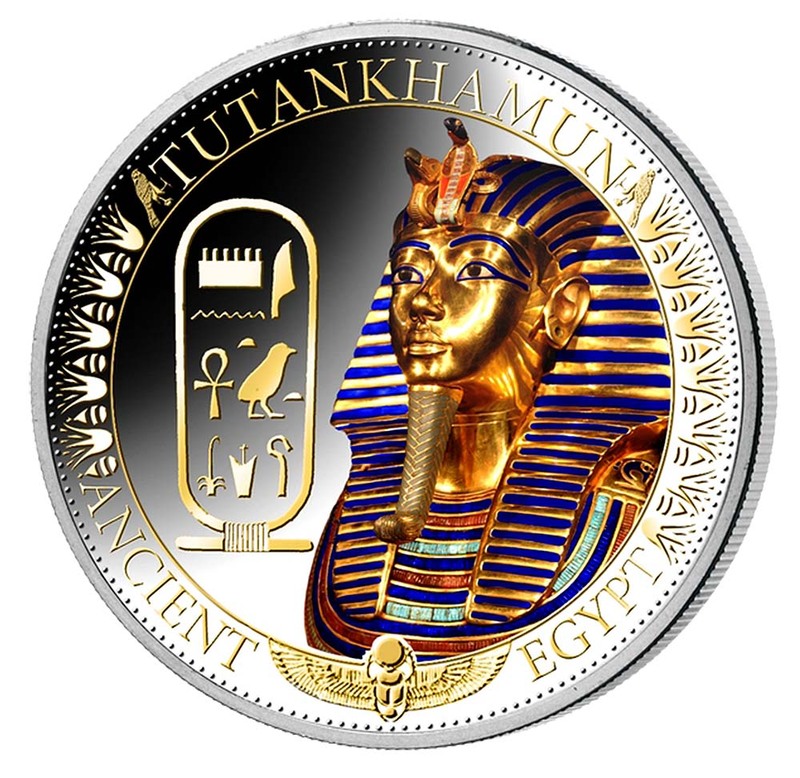 Tutankhamun means “Living Image of Amun”. The 1922 discovery by Howard Carter and George Herbert sparked a renewed public interest in ancient Egypt, for which Tutankhamun’s burial mask, now in Cairo Museum, remains the popular symbol. There are no surviving records of Tutankhamun’s final days. What caused Tutankhamun’s death has been the subject of considerable debate. Neferneferuaten Nefertiti(ca. 1370–1330 BC) was the Great Royal Wife of Akhenaten, an Egyptian Pharaoh. Nefertiti and her husband were known for a religious revolution, in which they worshiped one god only, Aten, or the sun disc. 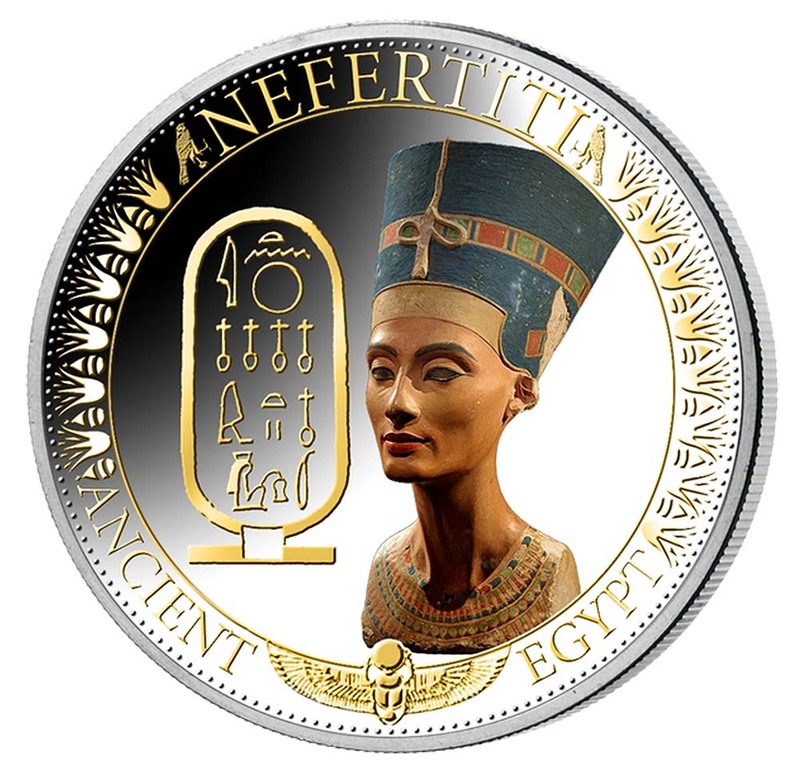 With her husband, she reigned at what was arguably the wealthiest period of Ancient Egyptian history, and she may even have ruled briefly as Neferneferuaten after her husband’s death. She was made famous by her bust, now in Berlin’s Neues Museum. It was attributed to the sculptor Thutmose, and it was found in his workshop. Scarabs were popular amulets in ancient Egypt. They survive in large numbers and, through their inscriptions and typology, they are an important source of information for archeologists and historians of the Ancient world. Thet were enormously popular in Ancient Egypt by the early Middle Kingdom (approx 2000BCE) and remained so for the rest of the pharaonic period and beyond. Scarabs were generally either carved from stone or moulded from Egyptian faience. Once carved, they would typically be glazed blue or green and then fired. The most common stone used for scarabs was a form of steatite, a soft stone which becomes hard when fired (forming enstatite). 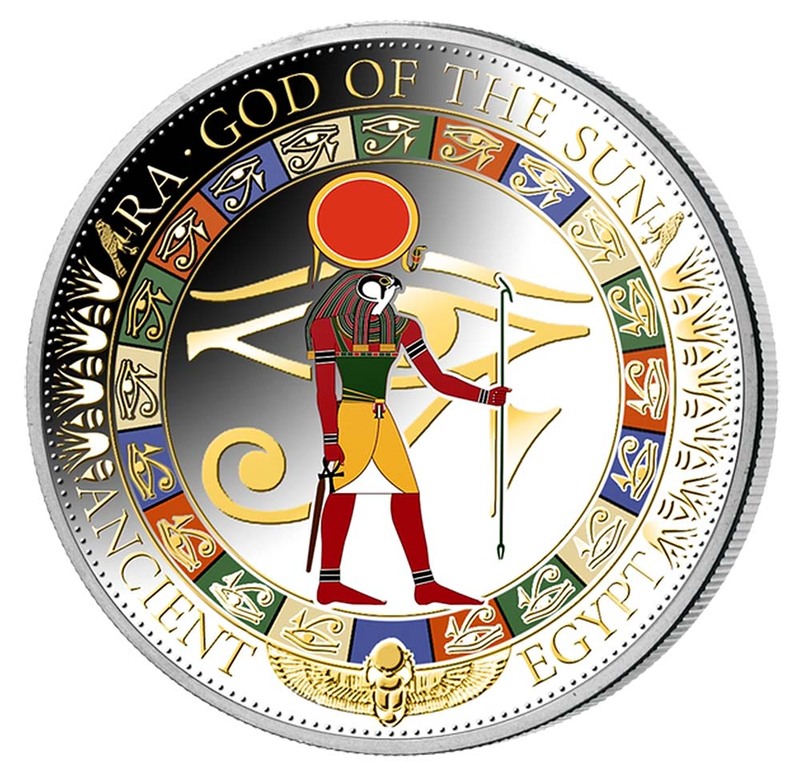 Ra is the ancient Egyptian solar deity. By the Fifth Dynasty (2494 to 2345 BCE) he had become a major god in ancient Egyptian religion, identified primarily with the midday sun. In later Egyptian dynastic times, Ra was merged with the god Horus, as Ra-Horakhty (“Ra, who is Horus of the Two Horizons”). He was believed to rule in all parts of the created world: the sky, the earth, and the underworld. He was associated with the falcon or hawk. All forms of life were believed to have been created by Ra, who called each of them into existence by speaking their secret names. The Egyptian pyramids are huge structures built of brick or stone, some of which are among the world’s largest constructions. They are shaped as a reference to the rays of the sun. Most pyramids had a polished, highly reflective white limestone surface, in order to give them a shining appearance when viewed from a distance. The capstone was usually made of hard stone – granite or basalt – and could be plated with gold, silver, or electrum and would also be highly reflective. 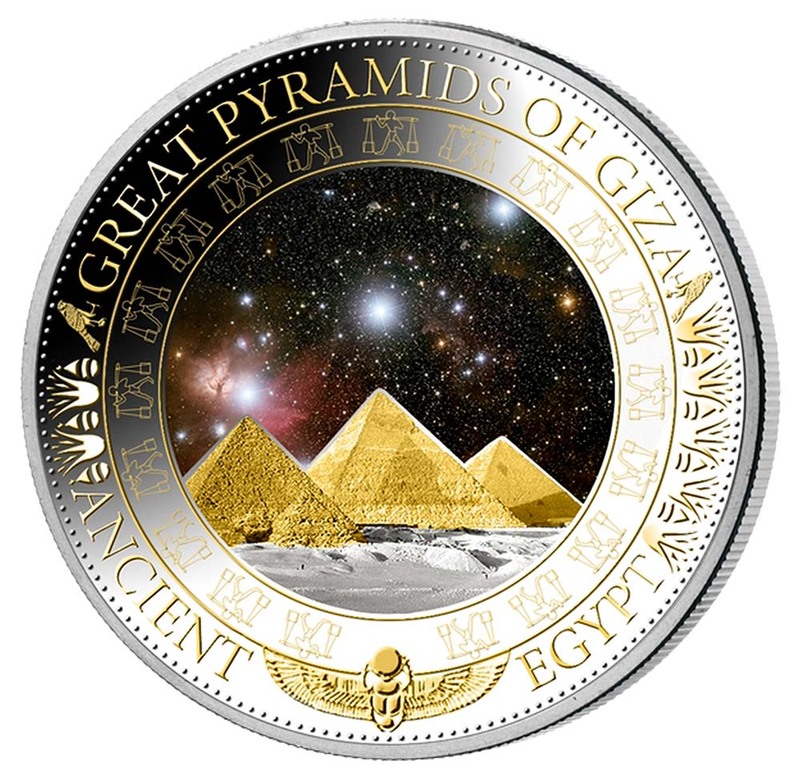 The age of the pyramids reached its zenith at Giza in 2575–2150 BC. The Great Pyramid of Giza is the largest in Egypt and was the tallest building in the world until Lincoln Cathedral was finished in 1311 AD. A sphinx is a mythical creature with, as a minimum, the head of a human and the body of a lion. The largest and most famous sphinx is the Great Sphinx of Giza, situated on the Giza Plateau adjacent to the Great Pyramids of Giza on the west bank of the Nile River and facing due east. 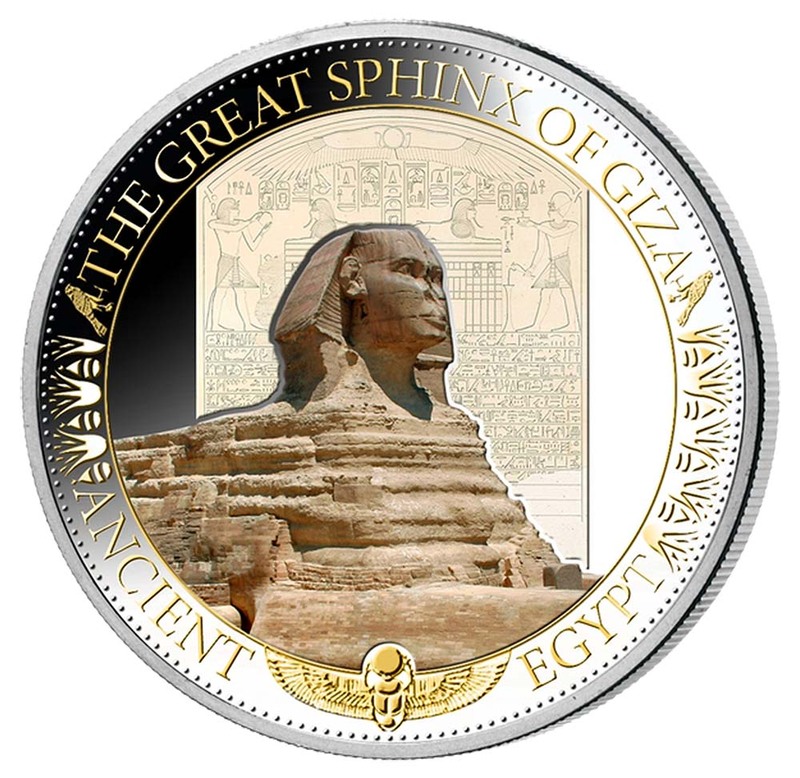 The sphinx is located southeast of the pyramids. Although the date of its construction is uncertain, the head of the Great Sphinx now is believed to be that of the pharaoh Khafra. The inclusion of these figures in tomb and temple complexes quickly became traditional and many pharaohs had their heads carved atop the guardian statues for their tombs to show their close relationship with the powerful solar deity, Sekhmet, a lioness. 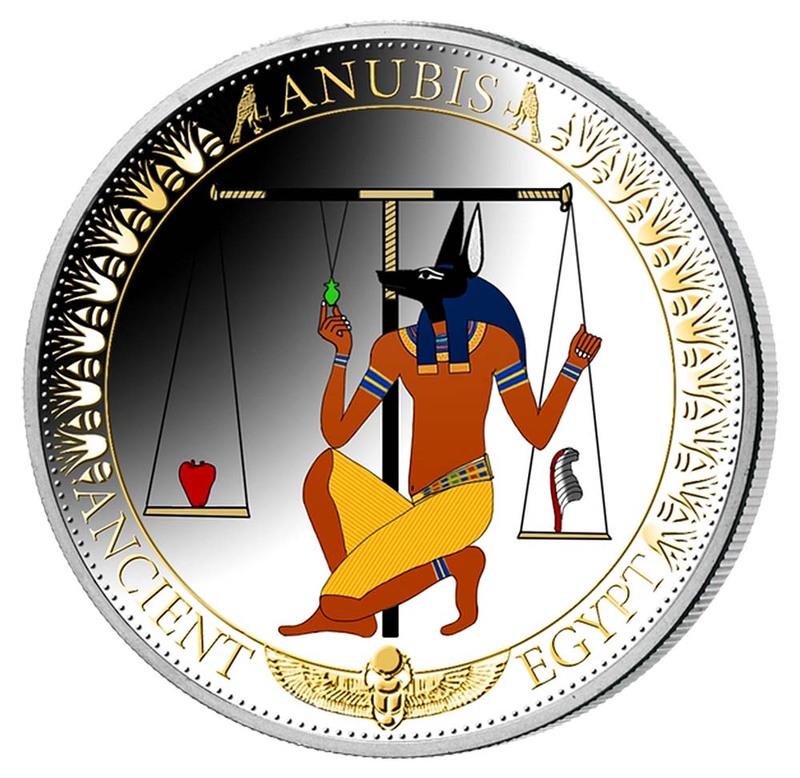 Anubis is the Greek name of a jackal-headed god associated with mummification and the afterlife in ancient Egyptian religion. Depicted as a protector of graves as early as the First Dynasty (c. 3100 – c. 2890 BC), Anubis was also an embalmer. By the Middle Kingdom (c. 2055 – 1650 BC), Anubis was replaced by Osiris in his role as Lord of the underworld. One of his prominent roles was as a god who ushered souls into the afterlife. He attended the weighing scale during the “Weighing of the Heart,” in which it was determined whether a soul would be allowed to enter the realm of the dead. Despite being one of the most ancient and “one of the most frequently depicted and mentioned gods” in the Egyptian pantheon, however, Anubis played almost no role in Egyptian myths. Canopic jars were used by the Ancient Egyptians during the mummification process to store and preserve the viscera of their owner for the afterlife. They were commonly either carved from limestone or were made of pottery. These jars were used by the Ancient Egyptians from the time of the Old Kingdom up until the time of the Late Period or the Ptolemaic Period, by which time the viscera were simply wrapped and placed with the body. The viscera were not kept in a single canopic jar: each jar was reserved for specific organs. The name “canopic” reflects the mistaken association by early Egyptologists with the Greek legend of Canopus. 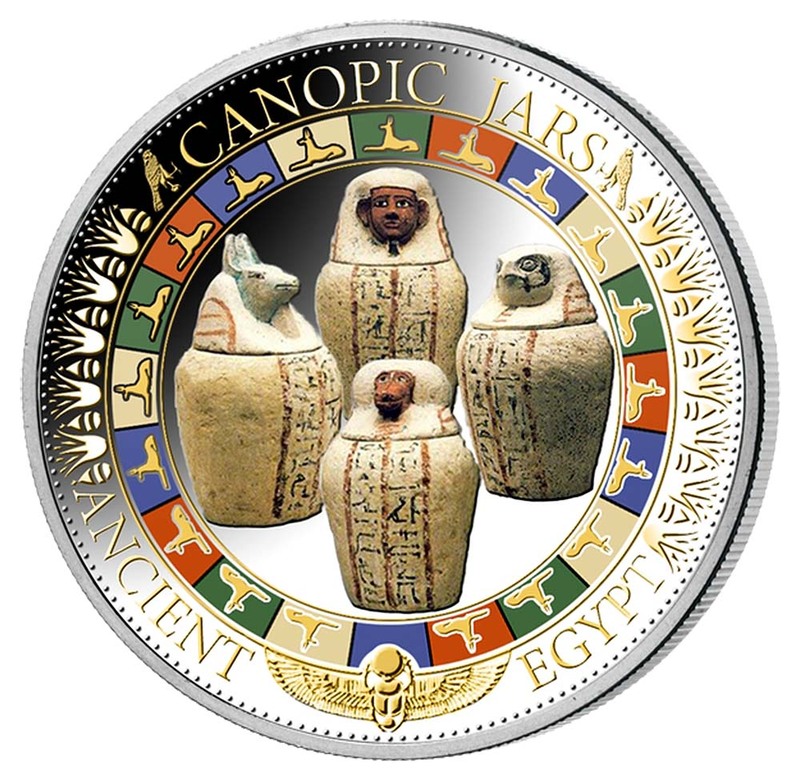 The canopic jars were four in number, each for the safekeeping of particular human organs: the stomach, intestines, lungs, and liver, all of which, it was believed, would be needed in the afterlife. Horus served many functions in the Egyptian pantheon, most notably being a god of the sun, war and protection and was worshipped from at least the late Predynastic period through to Greco-Roman times. Osiris was usually identified as the god of the afterlife, the underworld and the dead. He was classically depicted as a green-skinned man with a pharaoh’s beard, partially mummy-wrapped at the legs, wearing a distinctive crown with two large ostrich feathers at either side, and holding a symbolic crook and flail. Isis was worshipped as the ideal mother and wife as well as the patroness of nature and magic. She was the friend of slaves, sinners, artisans and the downtrodden, but she also listened to the prayers of the wealthy, maidens, aristocrats and rulers. Two massive rock temples at Abu Simbel a village in Nubia, southern Egypt, near the border with Sudan. The twin temples were originally carved out of the mountainside during the reign of Pharaoh Ramesses II in the 13th century BC, as a lasting monument to himself and his queen Nefertari, to commemorate his victory at the Battle of Kadesh. Construction of the temple complex started in approximately 1264 BC and lasted for about 20 years, until 1244 BC. Known as the “Temple of Ramesses, beloved by Amun” it was one of six rock temples erected in Nubia during the long reign of Ramesses II. Their purpose was to impress Egypt’s southern neighbours, and also to reinforce the status of Egyptian religion in the region. Historians say that the design of Abu Simbel expresses a measure of ego and pride in Ramesses II. 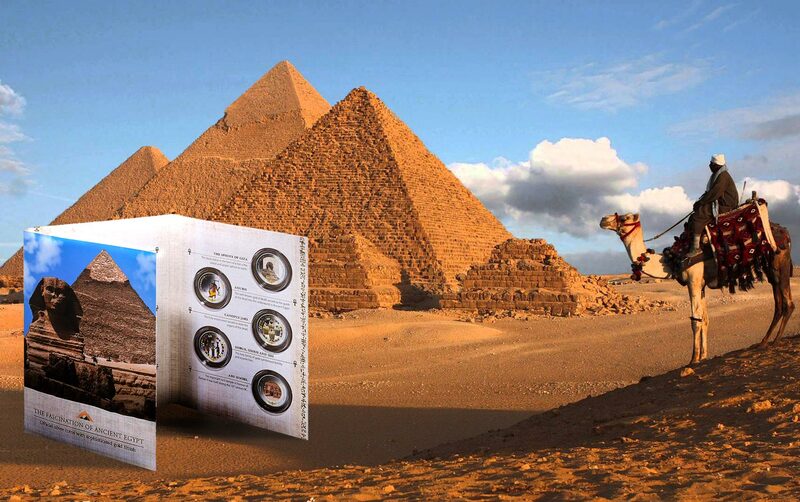 “Ancient Egypt” is a country full of myths and secrets, many of which remain unsolved to this day. With a history stretching back over 3,000 years, this important civilization attracts greater interest than almost any other. 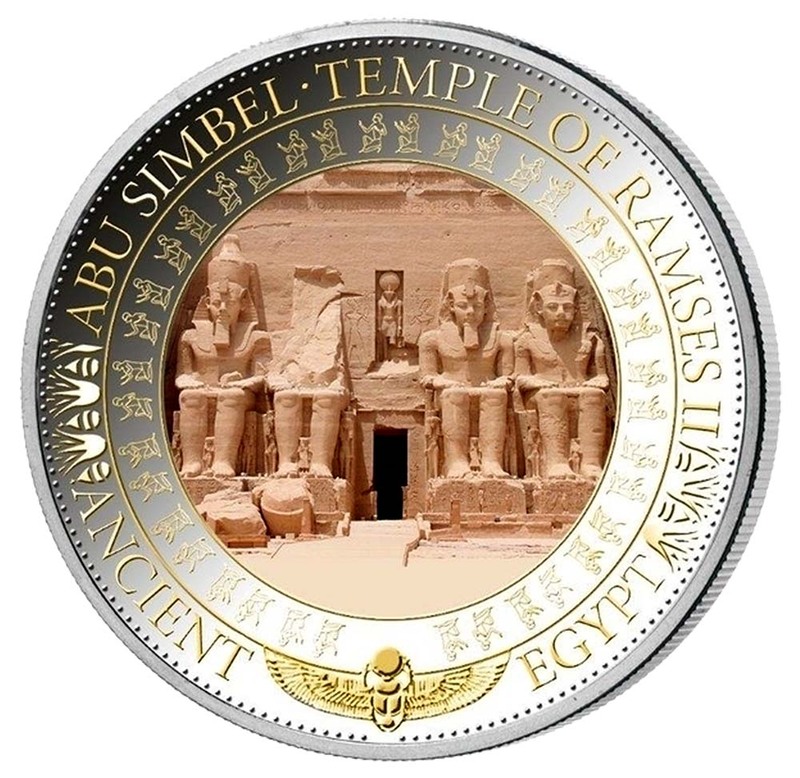 The impressive treasures, artwork and structures have now been honoured in gold-plated commemorative coins with a stunning colour finish. Please advise if these coins are still available and what they cost. Have not seen these for ages and only at the Royal Canadian Mint. That mint is showing them as unavailable, but I’d suggest contacting them to see if they have any left.Other than that, I can only suggest keeping an eye on eBay.